With so many different makes and models to choose from purchasing a Cycling Helmet can prove to be a very difficult task, as a consequence Velodrome Shop guides you through the Helmets and Models that we have for sale in order to make your decision that little bit easier. When it comes to choosing a new helmet the choice is outstanding however with so many helmets to choose you need to narrow things down to size/fit, purpose, looks and first and foremost safety. All modern helmets are require to meet the EN 1078 Satefy Standard, entitled Helmets for pedal cyclists and for users of skateboards and roller skates, is a European standard published in 1997. It is the basis of the identical British Standard BS EN 1078:1997. The argument that helmets do not save lives or protect your head on impact over 15mph is long gone, with modern helmets now clinically proven to reduce the amount of injury to a riders head in the event of a crash, so there is no excuse for not wearing one! With regards to commuters and riders who do not compete, although in the majority of countries no law exists that makes helmet use compulsory, most insurance companies will take this into consideration if you have been involved in a crash, so it is advised that whatever type of cyclist you are, you wear a helmet! It is recommended that you replace your helmet after two years due to UV rays causing the EVA foam construction materials to become more brittle over time and as a result less safe. This combined with the general wear and tear an average cyclist will inflict on a helmet over this period means modern safety standards recommend that you replace your helmet every two years. Let's move on to discussing Helmet sizes and how to measure your head to ascertain your required size. 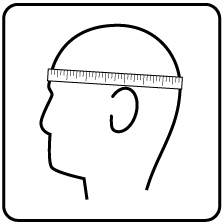 Even if you own a helmet already we advise you to re-measure your head in order to ensure your new helmet is the correct size, all manufacturers follow different guidelines so rather than go for a medium because your existing helmet is a medium it is best to re-measure and check the size guidelines for your chosen helmet. If, for example, you have a 56cm measurement and a Medium helmet's size guidelines are 54cm-58cm you will require a Medium helmet. If you are at either end of the scale, i.e. a 54cm or 58cm measurement you will still require the Medium helmet as these guidelines allow plenty room for adjustment. Until recently the options for this category of helmet were limited however now that time trial helmets have become more molded rather than tear drop in shape they are suitable for use in all Track events, something unique to the Track as a cycling discipline. Time Trial Helmets are traditionally used for the Kilometre and 500m Time Trial, Pursuit and Team Pursuit. Traditional Aero Helmets were designed to achieve very strong aerodynamic performance in a linear position. The nature of cycling means prevents us from adopting this position outside of a windtunnel. In 2012 Casco introduced adaptive aerodynamics, designed to produce outstanding aerodynamics when your head is in ANY position, saving your energy and improving your time. 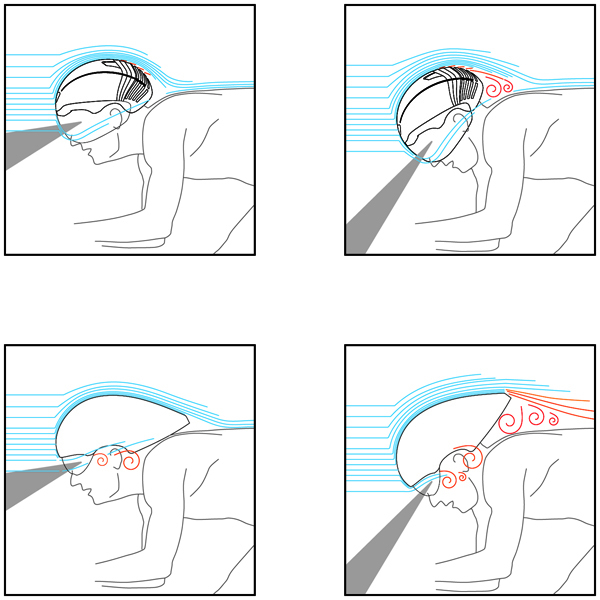 This characteristic promotes effective mobilisation of the bodys reserves without losing the benefits of aerodynamics. The results of Casco's wind tunnel testing of the Casco Speed Time produced dramatically improved aerodynamics for Time Trials and Triathlons in comparison to the traditional cone-shaped Time Trial helmets that have previously dominated the sport. Helmets following the traditional cone-shaped design for aerodynamics cause a huge loss of speed and aerodynamics with even centimetre variations in the cyclists head position. These movements are impossible to restrict but the Casco Speed Time negates the effect of head movement and provides cyclists with the faster helmet ever produced. Other manufacturers followed this trend meaning Time Trial helmets evolved to a more molded round shape meaning they are commonly used in all of the Track Cycling disciplines, for example a cyclist can ride in the Sprint, Pursuit and Points Race in the same helmet. A lot of Track Cyclists still prefer this kind of helmet whilst riding on a velodrome in the longer Track Cycling events however current trends have seen aerodynamic helmets become much more ventilated and hence suitable for this kind of use. As a consequence what was previously thought of as a time trial helmet can now be used in most Track Cycling disciplines, as mentioned in the Sprint Helmets and Time Trial Helmets sections above.